Etchings on the federal courthouse in Boston acclaim a well-administered justice system, but many working in the building say that is getting harder, given the continuing federal shutdown. In federal courts around the nation, the wheels of justice may soon be grinding to a halt. The government shutdown has already caused delays and disruptions throughout the federal court system, and officials are bracing for things to get a lot worse next week. The strain is apparent among lawyers walking in and out of Boston's Federal District Court. Passing in front of famous quotes carved in stone, espousing the importance of a smooth-running system of justice, many attorneys say that ideal is becoming more elusive each day the shutdown drags on. "There is that huge uncertainty, and it will impact our clients' access to justice," says Julie Olson, an assistant federal public defender on her way in to meet a client. Public defenders get paid by the courts and have been getting their paychecks, at least so far. But they are "watching every penny" and slashing spending, hoping to stretch their funding as long as possible. It is not without challenges, Olson says. It is certainly harder to mount a strong defense when, for example, the expert witnesses you want to hire can't count on getting paid. "Hopefully they will trust it works out in the end," she says with a sigh. "But yeah, we're asking consultants and experts to work on faith." The problem is even more acute for the pool of private practice defense attorneys who represent indigent clients when public defenders cannot. Because they're independent contractors, the courts stopped paying them — and the experts they hire — when the shutdown first began. On the other side, prosecutors are also feeling the pinch, both personally, and on their cases. As employees of the Justice Department they've all been working without pay, or have been furloughed, since December. "It's difficult," says Lawrence Leiser, president of the National Association of Assistant United States Attorneys. "It's a little demoralizing, and as time goes on, the worse it's going to get." Civil cases brought by the government, for example for alleged environmental or securities violations, have been stalled. And while the official word is that criminal cases are proceeding uninterrupted, Leiser says that is not quite the case. "As the spigot is turned off, it's beginning to impact our ability to protect the innocent and prosecute the guilty," he says. Prosecutors are already running out of money for such basics as DNA testing, paying informants or traveling to interview victims and witnesses, Leiser says, and that is hobbling, for example, even a major investigation of an alleged child predator. "We don't have the funding to conduct investigations and get the bad guys off the street in a timely fashion," he says. Ripples from the shutdown of multiple federal agencies are adding to the courts' complications. For example, in the Southern District of New York, District Executive Edward Friedland says staffing constraints in prisons are limiting attorney-client visits, so lawyers are asking the court to postpone hearings. Friedland says his court also recently had to curtail bail hearings because U.S. marshals who transport prisoners are reducing their hours. "We would normally run well into the evening if new arrests come in," Friedland says. "But right now, we're cutting it off at 3 p.m., so if you're brought in after, you won't be processed until the next day, which means you're going to be in jail an extra night." Such delays are not only costly, but they may also be unconstitutional, says Maine's U.S. District Court Judge Jon Levy. "The old adage that 'justice delayed is justice denied' is true," he says. "So I think we have to be concerned about challenges regarding the right to a speedy trial that we typically don't face." Some courts have been taking a hard line against delays, even on civil cases. U.S. District Judge Joseph Goodwin, from the Southern District of West Virginia, issued an order early in the shutdown, saying "the government, like all parties, is required to find the means by which to [keep cases on track] regardless of internal issues" and "should not be given special ... accommodation ... unavailable to other litigants." In Boston, U.S. District Court Judge William Young has been even more scathing in denying government requests for delays. "Lapses in appropriations are ... simply an abdication by the President and Congress ... to govern responsibly," he wrote in one order. He goes on to mock the government, comparing it to a corporation that lays off its attorneys and then asks the court for indulgence "until we get our act together." The logic, Young writes, "is laughable." The government "cannot delay or deny other litigants their constitutional access to their day in federal court," he concludes. Young tells NPR he won't let the shutdown "change the job I have to do," but he acknowledges that calculations will change when the money runs out. "I honestly don't know," he says. "We'll cross that bridge when we come to it." Meantime, courts are scrambling to come up with contingency plans. The Administrative Office of the United States Courts announced Tuesday that funding that had been expected to run out on Jan. 25 will now extend through Jan. 31, "thanks to the continued extraordinary efforts" to cut costs. Courts have been using those savings, plus revenues from court filing fees and some creative accounting, to keep paychecks coming to public defenders, probation officers, interpreters and others, including jurors. But officials make clear that "no further extensions ... will be possible." So if the shutdown continues, it enters a whole new phase, where courts could only do work that's constitutionally mandated to protect life, liberty and property. Each court would be left to figure out itself which staff it needs "to support its mission critical work." Many are considering draconian measures to triage cases. In the Northern District of Illinois, Chief Judge Ruben Castillo says his next step would be to halt all civil cases. "So when somebody has some civil rights claim [against the police] or an employment discrimination case involving sexual harassment, all those cases will just come to a grinding stop," he says. "That's basically the sad story. There is a price that this country is going to pay that far surpasses anything anyone realizes." "It will be a disaster," is how Friedland of New York's Southern District sums it up. "The judicial process will almost come to grinding halt." He is working around the clock on contingency plans for every detail, large and small. "I have to go speak to all the delis and local restaurants in town and say, 'We would like to continue to order [jury lunches] from you, but [after the 31st] all I can offer you is an IOU.' " He also worries whether juror candidates will show up, if the courts no longer pay their $50 daily stipend and reimburse them for travel. He is also looking into a Plan B, in case he can't keep the maintenance crews who keep the courthouse running. Friedland is now dusting off an old doomsday plan, designed years ago during the bird flu scare. "I never thought we'd have to use it for this," Friedland says. "But if in fact the buildings can't stay open, we literally will have judges at their kitchen tables with a laptop computer with a camera on top, looking at a defendant who's sitting at a U.S. marshals' holding cell somewhere, conducting these hearings." Meantime, many prosecutors and public defenders, like Olson, are vowing to keep working, with or without a paycheck. "We're going to still have to do whatever it is we have to do," she says. "We'll beg, borrow, and ... well, not steal," she says, chuckling, before turning serious again. "Even if I'm not paid, I still can't let my client sit in a prison. It just can't happen. My client's liberty interest comes first." Still, the prospect of going unpaid does weigh on her. "It's very nerve-wracking," she says. "I'm well into my 40s, and I still have substantial student loans ... that I'm paying off, and living expenses, so the threat is frightening." Castillo calls it a betrayal of public servants, who are already sacrificing by working for a government salary when they could make more in the private sector. "It feels like we're on the front lines trying to fight a battle while our own forces are shooting us in the back." he says. Since the shutdown, he has already seen about 5 percent of his staff retire, or quit, he says. "I'm losing key people," he says. "What are we doing here? This is just so self-defeating." Especially since the defections will only make it even harder to dig out from the big backlog of cases courts will face, when the shutdown finally ends. In federal courts around the nation, the wheels of justice may soon be grinding to a halt. The government shutdown has already caused court delays and disruptions. But as NPR's Tovia Smith reports, things may get a lot worse next week. 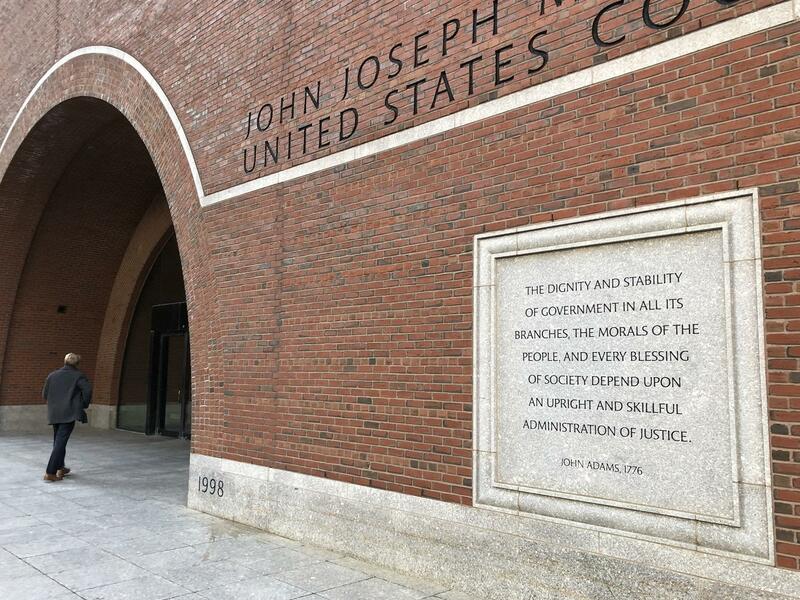 TOVIA SMITH, BYLINE: It's carved in stone on the front of the federal court in Boston that the whole government depends on the, quote, "skillful administration of justice." But for many who do that job, it's getting harder. JULIE OLSON: There is that huge uncertainty. And it will impact our clients' access to justice. SMITH: Public defenders like Julie Olson say it's getting harder to mount a strong defense when the expert witnesses you want to hire, for example, don't know if they'll get paid. OLSON: Hopefully they will trust that this will all shake out in the end. But yeah, we're sort of asking consultants and experts to work on faith. SMITH: On the other side, prosecutors are also feeling the pinch. LAWRENCE LEISER: It's difficult. It's a little demoralizing. And as time goes on, the worse it's going to get. SMITH: Lawrence Leiser heads the National Association of Assistant U.S. Attorneys, all of whom are either furloughed or working without pay. That has stalled civil cases brought by the government. And while the official word is that criminal cases are carrying on uninterrupted, Leiser says not quite. LEISER: As that spicket is being turned off, it's beginning to impact our ability to protect the innocent, prosecute the guilty. SMITH: Leiser says prosecutors are running out of money for basics like DNA testing, paying informants or traveling to interview victims and witnesses. And that's hobbling, for example, even a major investigation of an alleged child predator. LEISER: We don't have the funding to conduct the investigation and get the bad guys off the street in a timely fashion. SMITH: Courts are also feeling the ripples from other federal agencies. For example, in the Southern District of New York, officials say prison staffing constraints are limiting attorney-client visits, so the court is being asked to postpone hearings. That court has also limited bail hearings because U.S. marshals, who transport prisoners, are reducing their hours. So some defendants who might have gotten bail are now spending an extra night in jail. Such delays are not only costly, but Maine's chief federal District Court judge, Jon Levy, says they may also be unconstitutional. JON LEVY: The old adage justice delayed is justice denied is true. So I think we have to be concerned about challenges regarding the right to a speedy trial that we typically don't face. SMITH: Unlike the prosecutors going unpaid by the Justice Department, those paid by the courts - like public defenders, probation officers, interpreters and jurors - are still getting paychecks, thanks to court fees and some creative accounting. But that money runs out next week. And courts say they'll have to implement draconian triage measures if the shutdown continues. EDWARD FRIEDLAND: It will be a disaster. The judicial process will almost come to a grinding halt. SMITH: District Executive Edward Friedland from the Southern District of New York Federal Court says he's worried that even maintenance crews who keep the court open may not be for long. And he's planning for the worst. FRIEDLAND: If in fact the buildings can't stay open, we literally will have judges sitting at their kitchen tables with a laptop computer with a camera on top looking at a defendant who's sitting in a U.S. marshal holding cell somewhere conducting these hearings. SMITH: Outside Boston federal court, many prosecutors and public defenders like Julie Olson vow to keep working with or without pay. OLSON: We're going to still have to do whatever it is we have to do. I still can't let my client sit in a prison. It just can't happen. SMITH: But the prospect of going unpaid weighs on her. OLSON: It's very nerve-wracking. We have student debt that I'm paying off and, you know, living expenses. And so the threat is frightening. SMITH: Courts say they're already seeing some people retire or leave for jobs in the private sector. It's all the more frustrating since that'll make it even harder to dig out through the big backlog of cases courts will face when the shutdown finally ends. Tovia Smith, NPR News. Transcript provided by NPR, Copyright NPR.